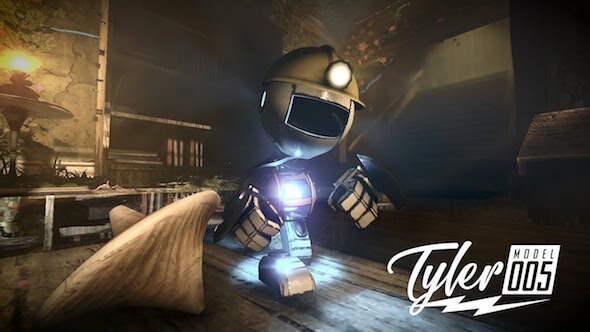 Tyler: Model 005 is the second Steam game from Reversed Interactive. It is also its second one featuring robots and the sixties theme. 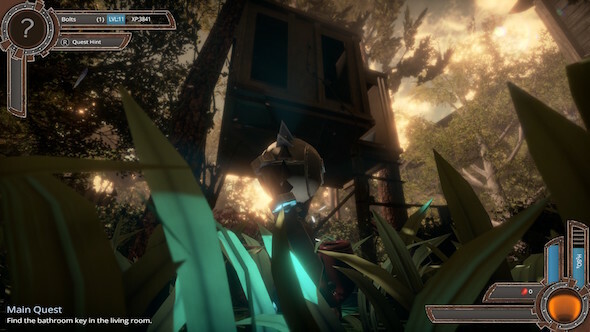 Their first title, Disassembled, was a VR enabled action game. This time it’s about exploration and survival! A long time ago, around the year 1950, an inventor designed and assembled several miniature robots. This includes you, a tiny robot called Tyler. Several decades later you abruptly boot again after a lightning strike struck the house. Having spent so long in a powered down state, you lost most of your memory. As a result you barely recognize the house as nature has taken over. This translates into you occasionally encountering plants, bugs and vermin that have made some place of the house their own. Still groggy from the corrupt memory of your long slumber, you’re immediately drawn to the bright light further on. You see, not only do you crave for light, you need it for survival as well. You recharge at any light source, from regular sunlight to oil lamps, televisions and even fireflies. 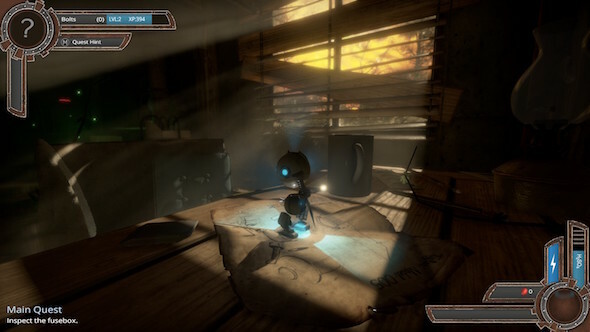 As you make your way through the house, recovering memories, opening locked doors and talking to other surviving robots, you learn about your past and what happened with your creator! 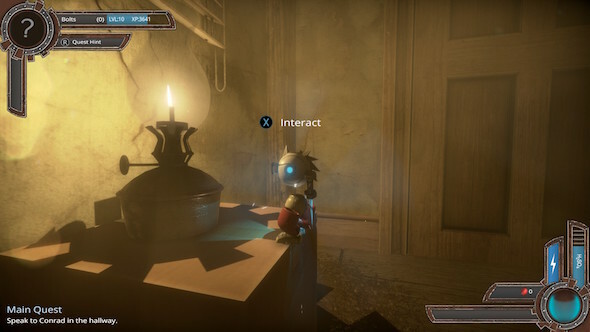 Missions are given by yourself (your survival instinct) or other robots, the objectives appearing as speech bubbles or plain text on your screen. No other cutscenes or intermezzos are present. The game starts off with several clips showcasing your design and creation process. These all look beautiful and relieves you of the indie feeling you had when accessing the ugly and simple menu and the slow profile loading process. Nevertheless, the bridge between those clips and the real environment you’ll be playing in is disrupted by a lower quality introduction clip. A shame because the inside of the house looks rather good! The lighting is fantastically done, darker mysterious (and dangerous) areas are interrupted by small amounts of light, creating patches where you can recharge and take a break from the hastily parkouring you do. When you light up more lamps and fill the rooms with warm yellow light, these safe areas expand and you have more time looking for clues, collectibles and mission-critical items. The game is quite demanding and is rather unplayable on integrated graphics, even on the lowest settings available… This is reflected by the Steam minimum and recommended specs so at least you have been warned! If you love Fallout’s sixties tune, you’ll feel right at home here. Tyler: Model 005 has a similar soundtrack and it fits right in with the fifty’s interior. In contrast with the lovely background music you’ll have to endure Tyler’s silly and annoying voice, – even though it’s acted well. Tyler will give remarks on performing certain acts like jumping around, and sometimes tells you his thoughts or repeats the mission objectives. There are also plenty of sound effects added. From your character’s cries when you jump or attack, to explosions and the sounds the various enemies make. When strolling in the dark, the latter will certainly work on your nerves since it doesn’t take much to take you out. Lastly, many objects are destructible or interactable, each having proper sound effects as well. This is a puzzler/adventure/RPG/tower defence game. You have to make your way into a large and mostly dark house, finding or enabling light sources in order to charge up and get further. You also need to collect several mission critical objects, like keys, in order to progress the main mission. Other collectibles include enemy dust, used to level up. Also included are customisations. With these you can customise your robot for aesthetic reasons at customisation points, but certain combinations also provide passive boosts to your stats. Leveling up and completing Tower defence side quests grant you nuts which you can use to upgrade yourself at upgrade stations. These all cost two nuts, so you can freely choose which parts you upgrade right from the beginning. These Tower defence side quests are quite fun. 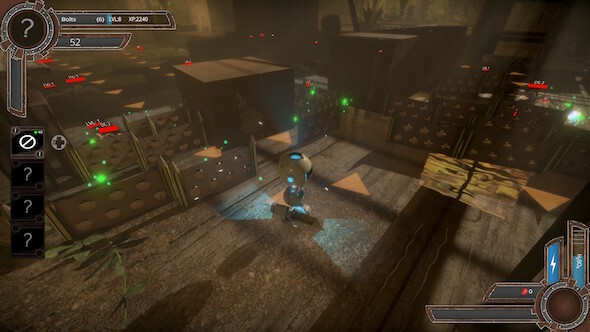 You build your defences around a hub with elements made from office material and try to defeat increasingly difficult waves of enemies. These enemies trail a path shown on the map, but still you might have to try again sometimes because it’s easy to get surprised by a sudden herd of enemies stabbing you in the back. This is because you need to walk around gathering the dead enemies’ dust, which you need to build those defences. Enemies are also omnipresent in the house and the garden as well, with different and increasingly difficult types encountered as you progress the story. Combat results mostly into wild hacking and slashing around, so it’s often easier to just dodge enemies than to engage them. While keyboard is supported it is a torture to play Tyler: Model 005 with; a controller is a must! This fun game looks small and short, but actually provides you with many hours of fun and challenging exploration and gameplay. While the sixties sound theme is definitely a plus, you need at least a dedicated graphics card to run this game smoothly on any graphics setting. A controller is a must to handle Tyler, but even then, it’s far from perfect. Tyler: Model 005 is a bit a mix of different game genres, but somehow they managed to put it all together in a non-disturbing way. A lot of content in a very reasonably priced game. Well done Reversed Interactive!